We are now offering this song to any or all who wish to use it as part of their celebration of the Easter Rising 2016. The song was composed in the 1950s by the then very popular playwright P.G. O’Dea, and is very much of its time. 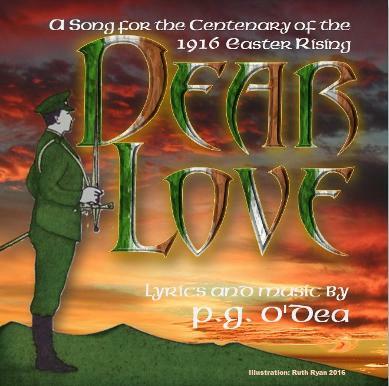 Composed in an era before pop music or the ballad boom, O’Dea’s song is solemn, serious and respectful. It is a song of love, as the title suggests, on behalf of those who fought to free their loved one – ‘Róisín Dubh’, Ireland – glad to prove their love by giving their lives for her sake. The lyrics are powerful, heroic, and would easily lend themselves to a different treatment if required. Many would prefer, perhaps, a more up-tempo rhythm, and this could be achieved by a singer and guitar, an ensemble, or even a full group, band orchestra. we can be proud as we serenade our ‘Róisín Dubh’ and celebrate the sacrifice and ambitions of those who wrested from the world’s super-power the freedoms she – and we – have today. Playwright P.G. O'Dea was born in Limerick in 1898, but spent many of his working years in Athlone, where he worked as a teacher in Athlone Vocational School. His Court Devenish home, close to the river Shannon, provided the spiritual inspiration for the genial wit and intellect of the author. It was from this idyllic base that P.G. wrote his a vast library of plays, including such perennial favourites as "Johnnie's Britches", "Poor Jimmy", "Paddy the Englishman", "Kitty Breaks the Ice", "Down the Middle", "A Man of Ideas", "The Diddler", etc.. Such was the demand for his plays during P.G. O'Dea’s lifetime that they could scarcely be printed quickly enough, and a new generation now stands ready to be "convulsed with laughter" as they experience the delight of a P.G. O'Dea play afresh. P.G. held an "Emergency Services Certificate", 1939-46, and signed by Sean Mac Eoin, having joined the Local Defence Forces (or F.C.A.) during the "Emergency" - i.e. the second World War. P.G. O'Dea had a keen interest in sport. He taught gymnastics to the army recruits at Custume Barracks, Athlone, and held many displays and demonstrations in the barracks' grounds and also the Vovcational School where he taught. P.G. O'Dea's plays have been performed at numerous venues all over Ireland, and have been widely acclaimed on the competitive circuit. They provide a unique insight into Irish rural life during the 40's, 50's, and 60's and are now considered to be true windows into the mind-set of the time, carefully observed by a wonderfully gifted craftsman. All his plays are intrinsically historical documents of that era, and they invite an audience to experience the tremendous sense of fun inherent in the mind of P.G.O'Dea, a teacher and a shrewd observer of people. "Dear Love" is his only song. It was written after the war (in the 50s) to commemorate those who gave their lives for Ireland, in the cause of Irish freedom, and deserves the same public airing and acclaim that his lays have always received. They fought the knave who would enslave, kept freedom to the fore. They lie asleep for you. Of voices hushed, of causes lost, ever to rise again. They smiled at death for you. Out from the gloom of freedom's tomb, to raise a battle shout. Again to die for you. You're free for ever more. You are free for ever more.